There were always a lot of conflicts around the peninsula Crimea. Just recently in 2014 this area was annexed by the Russian Federation. The consequences of these wars and conflicts you can see and feel till now. 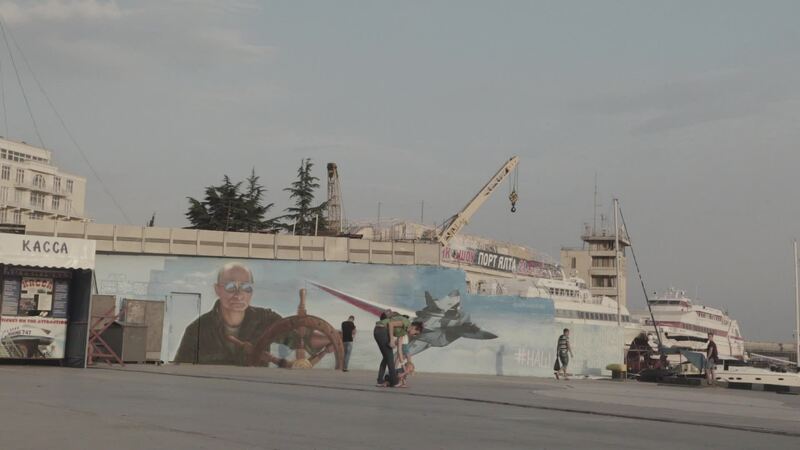 The pictures show the typical Crimea – endless beaches, tourism, boats and ferries, the lost sheen of the soviet union, graffities and happy nightlife. The protagonists, both fanatic Re-enactors (people who put after historical events) show and tell us a different story. These two are a mixture of tourist, imperialists and workers. They are proud to be Russian and they share with us their concept of the future, Europe, homosexualism and „playing war“. They have no doubt that Crimea is part of Russia. Crimea. The Emperors Dream is a political film about the future of the Crimea and Europe. Our heroes play war in a real war zone and the borders between fiction and reality become blurred.